Kind Traveler, a public-benefit corporation based in Malibu, is the first socially-conscious hotel booking platform of its kind. Customers use the platform to give a nightly donation to a local charity in the destination where they’re choosing to travel and thereby unlock exclusive hotel offers in over 30 locations, including Mexico, Costa Rica, and the Caribbean. When Kind Traveler’s co-founder and CEO Ms. Jessica Blotter designed the company to positively impact communities and the environment, she turned to the United Nations’ Sustainable Development Goals (SDGs) as a guidepost. "I liked that it was a globally-aligned framework with clear calls to action on how to create social change as a business," Blotter told the Pacific Council in an interview. "There is compelling research that shows nearly 90 percent of consumers will support a brand that is associated with a cause." Blotter was also finding research that showed 75 percent of travelers think it is important that their travel dollars impact destinations positively, but there was a lack of options for travelers to make informed choices. Thus, her company was born. "If businesses want to create a social [component], it’s imperative they look at the SDGs to make the impact that’s necessary for the planet right now." "There needs to be more communication so that businesses know the SDGs exist," she said. "If businesses want to create a social [component], it’s imperative they look at the SDGs to make the impact that’s necessary for the planet right now." She added that the SDGs can be a valuable tool for businesses that want to go beyond the bottom line by providing infrastructure and unity for greater impact. 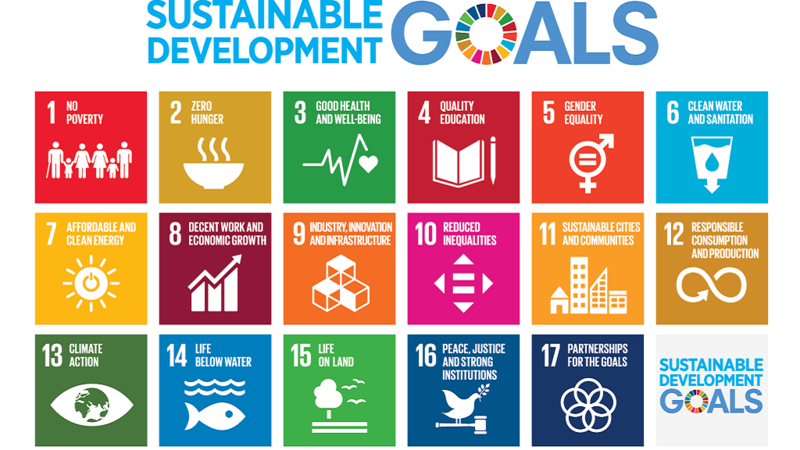 In 2015, the UN General Assembly adopted the Sustainable Development Goals, a set of 17 objectives to guide the global agenda through 2030, with the overall aim to reduce inequality. The Pacific Council has been part of the conversation about Los Angeles’ role in advancing the SDGs alongside leaders like the LA Mayor’s Office for International Affairs and the Conrad N. Hilton Foundation. This summer, the Office of LA Mayor Eric Garcetti, in a project sponsored by the Conrad N. Hilton Foundation in partnership with the Mayor's Fund for Los Angeles, the Thunderbird School of Global Management at Arizona State University, Occidental College, and UCLA's World Policy Analysis Center is overseeing a student task force to map and develop advisory councils and case studies of the city’s key stakeholders for SDG alignment in both the public and private sectors. Led by Ms. Erin Bromaghim, a Pacific Council member and Hilton Foundation fellow on the SDGs, students will build on work already started this spring to collect data and track LA’s progress against the 17 goals. "The SDGs are not just about faraway places but also LA," Bromaghim said in an interview. "Our project seeks to identify activity related to the SDGs across all sectors, to see what’s happening across LA. The goal is to show the gaps and identify new opportunities and potential partnerships where parties are working in the same space. We will synchronize the data and attempt to accelerate LA's progress toward the goals by 2030." The 18-student task force this summer will dive into charting the private and nonprofit sectors’ progress and key actors, creating "local inventory of the SDGs," she added. But they are also working to translate the goals to a local context, adapting certain targets for Los Angeles in a model that may be replicated by other cities around the world. "The Global Goals challenge us to build a better, more equitable world. To achieve our goals abroad we must start in our neighborhoods—from improving the quality of the air we breathe to expanding economic opportunities for the people we serve." "The Global Goals challenge us to build a better, more equitable world," Mayor Eric Garcetti said for this article. "To achieve our goals abroad we must start in our neighborhoods—from improving the quality of the air we breathe to expanding economic opportunities for the people we serve." Bromaghim noted Anheuser-Busch as an example of a corporation that is internalizing sustainable corporate practices beyond the traditional philanthropic approach of many large companies. Last year, Anheuser-Busch invested $10 million into its Van Nuys Brewery to improve water efficiency across its operations and was recognized by Mayor Garcetti for contributing to a more sustainable city. Sony has also officially adopted eight of the SDGs into their corporate strategy and are launching the Picture This! film festival in July, a showcase of short films inspired by the goals. Ms. Jenise Steverding has kept an eye on LA’s social enterprise sector as a whole since her days at TOMS Shoes, where she was the third hire in their giving department. TOMS, based in Playa Vista, is the originator of the One-for-One model, giving a pair of new shoes for every pair purchased. "It’s very hard to take a big global goal and apply it to what you’re doing as a small company," said Steverding, who is now chief impact officer at Gifts for Good, the only business focused on helping corporations add social impact through client and employee gifting. "In LA, one of the challenges is that we don’t have many big companies’ headquarters here, so LA can get left behind in terms of philanthropy. This type of decision happens at the HQ level. We’re not Seattle, New York, or Silicon Valley, where big businesses are driving these decisions." Gifts for Good offers numerous products made in LA, employing those transitioning out of homelessness or people with developmental disabilities. By selling these products nationwide, the company seeks to help those in need in LA. Falcon Waterfree Technologies is another LA-based social enterprise that aligns with the SDGs, specifically Goal 6: Clean Water and Sanitation. Vice President of Legal and Human Resources David Paesani said that California’s progressive culture and strong environmental movement makes it the right place for companies focused on sustainability, especially with the growth of Silicon Beach as a technology hub. "LA is ideally suited as a hub for businesses and nonprofits to connect on the topic," he said. "The atmosphere for businesses is different here than on the East Coast, where nonprofits and for-profits are not as willing to cooperate. [But] the city is so large and there’s so much going on you might not know about it." He recommended the city of LA help to connect people working in the same space along the SDG metrics, which is one purpose of the student task force. "LA is ideally suited as a hub for businesses and nonprofits to connect on the topic of sustainability. The atmosphere for businesses is different here than on the East Coast." Falcon Waterfree Technologies creates water-saving products and was a community partner on the Pacific Council’s December 2017 Water Conference under the Global Water Scarcity Project. "Clean water and sanitation is our core business so it’s a natural fit with that SDG," Paesani said. "We are always selling our products in a way that makes a case about the need for sustainable water for the world…The institutional investments we’ve attracted are because of our social entrepreneurship goals, because we have a product that is going to help the world in some tangible way." Falcon operates in 40 countries and integrates their model into each culture, adhering to local plumbing codes. But Paesani notes that his company nor others can afford to be complacent. "The goals are always going to be ahead of us," he said. "The conditions that make these goals important are population growth and constraint of resources, which aren’t going away." Blotter agreed that unifying on the goals across sectors is the best strategy. "The biggest impact happens when we all work together," she said. Learn more about the Pacific Council's Global LA initiative.